Did you know that Envisage offers a fully featured eCommerce design service? Early last year we created an eCommerce design division called Internet Stores New Zealand (iSNZ). Partnering with programmer George Shaw, design director Simon Owen is now designing robust and feature-rich online stores every day. Our platform of choice is Bigcommerce. In fact, we’re so good with it the creators of Bigcommerce have named us ‘New Zealand’s Bigcommerce design partner’. We’re pretty chuffed about that. Bigcommerce makes it easy to sell online. iSNZ makes your store look appealing and function beautifully. 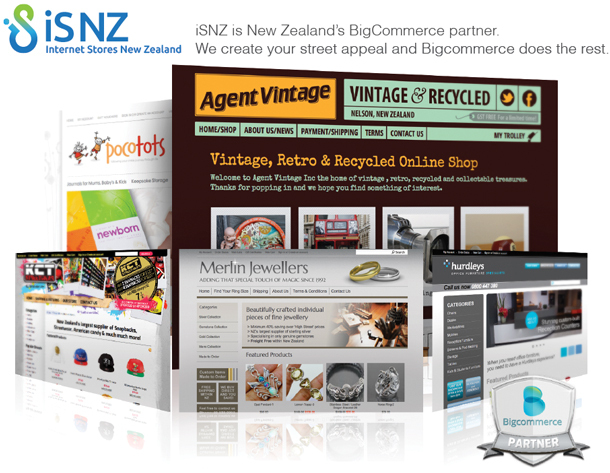 iSNZ know Bigcommerce inside out and no stone is unturned when it comes to maximising the extensive features Bigcommerce offer to help you sell more. We have designed over 16 successful stores and our client list is growing fast. As a web professional, I’ve worked with a lot of e-commerce platforms to help my customers sell online. Bigcommerce is the one I recommend most, thanks to their ease of use, powerful features and excellent customer support.